Perhaps there is one great love in everyone's life. For Princess Victoria Melita, or Ducky, hers was a Romanov, a member of the doomed Russian monarchy. Born a British Princess, Ducky's father was Prince Alfred, Duke of Edinburgh, Queen Victoria's second son. Her mother was Grand Duchess Marie, the daughter of Tsar Alexander II. As an adult, Ducky is confined in an unhappy marriage. Desperate for a new life, she begins to look for something more and this new adventure leads her far beyond England's bounds, from Malta to the French Rivera, Finland and St Petersburg. As Russia unravels in 1917 and the Romanov dynasty falls, Ducky - now reunited with her Romanov love - is right at the heart of it. The life of her family in danger, she must act bravely to stand a chance of escape. 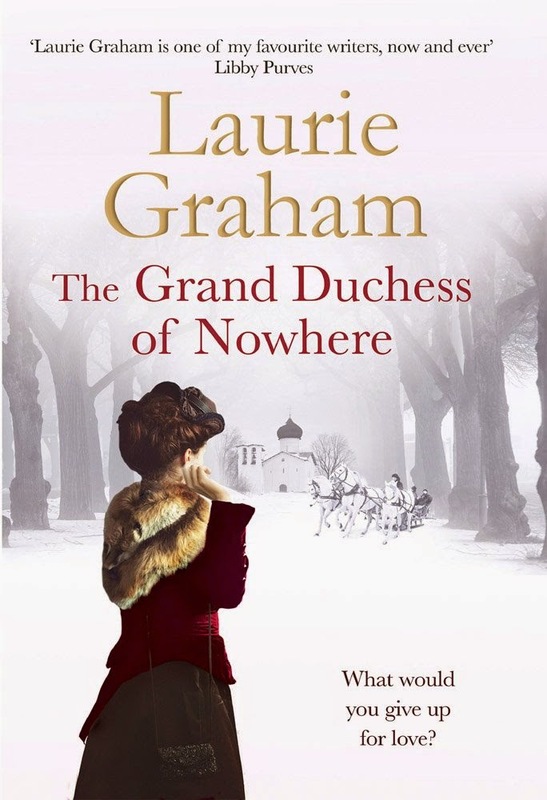 I review a lot of books, which makes it easy to become a little jaded, in that it takes a lot for me to be grabbed by an author voice – but Laurie Graham’s dry wit and colourful characterisation of the British Royal family into which Victoria Melita was born is so compelling - and I know it's a cliche, but I couldn’t put it down. Known by her large family and her 'Grandma Queen Victoria', as ‘Ducky’, Victoria sees her royal family as if she’s examining them through a looking glass. She loves them all but at the same time is pragmatic and accepting of all their faults, pride and questionable behaviour, but that doesn’t mean she doesn’t feel deep emotion, she simply has a very stoic English way of dealing with it. Her Mother, the Duchess of Edinburgh, a Romanov daughter of the Tsar who saw herself as grander than Queen Victoria, ‘who was after all only the daughter of a duke!’ Ducky recounts her hilarious attempts to upstage the British monarch in throwaway tone and a mental shrug of her shoulders..
Ducky’s account shows the family of Queen Victoria as individuals with their own problems, prejudices, infidelities, confused paternity and bad judgements. It’s a fabulous story and where we all imagine life must have been an easy dream for royalty, this book shows that nothing is quite as it seems and in our own way we are all teetering on the edge of the abyss. Ducky was destined to marry her handsome, and entertaining cousin, Ernie, approved of by ‘Grandma Queen’ despite being a Romanov, his refusal to grow up, devising jokes and games to irritate ‘Grandma Queen’ that made Ducky laugh at inappropriate moments. I really liked him, but their marriage was doomed, and Ducky’s grief over the loss of their only child, Elisabeth [Elli], from typhoid when she was eight, was heart-breaking. Ducky has to wait for the love of her life, Cyril, another cousin, who takes his sweet time in making an honest woman of her after her divorce. Ducky remains devoted and understanding of his casual love, which extends into their marriage. She loves him unreservedly, and I found it so sad when she clung desperately to every kind word he threw her way, determined to see him as simply undemonstrative rather than unloving. Ducky has two daughters who go some way to making up for losing Elli, and she recounts her days driving an ambulance during WWI and the onset of the Russian Revolution. This began for Ducky with a march of workers calling for bread. Her observations that the marchers didn’t look particularly undernourished to her, illustrates the dispassionate way the rich and sheltered had no notion of how the other half lived. Just as her mother-in-law's insistence they attend the opera while avoiding streets where crowds are rioting and hurling bricks through shop windows. Ducky wasn’t dismissive or even as unsympathetic like some of her contemporaries, merely bemused as to what all the fuss was about, although she is critical of the fact Tsar Nicholas ignored the entire thing until the riots and shooting of army officers in Petrograd [St Petersburg] had escalated into horror and there was no turning back. A fascinating and beautifully written story and one which deserves space on a shelf in anyone's library, especially mine! Anita Davison also writes as Anita Seymour, her 17th Century novel ‘Royalist Rebel’ was released by Pen and Sword Books, and she has two novels in The Woulfes of Loxsbeare series due for release in late 2014 from Books We Love. Her latest venture is an Edwardian cozy mystery being released next year by Robert Hale.